Director Martin Scorsese has made something of a two-pronged career for himself—the prong that gets the most attention would undoubtedly be his work in narrative feature films. While the lion’s share of attention towards the auteur focuses acutely on that side of his output, Scorsese has built up a formidable documentary filmography, focusing almost entirely on rock and roll music and its key players. After winning his long overdue Best Directing Oscar for 2006’s THE DEPARTED, Scorsese leapt right back into production on a concert film featuring The Rolling Stones—a band that’s as inextricably tied to Scorsese’s own body of work as they are to the history of rock music itself. Shot over the course of two nights in New York City’s historic Beacon Theatre, SHINE A LIGHT (2008) plays like a relatively conventional concert film, albeit a blockbuster one with some giant names on the marquee. Besides the Stones’ iconic roster consisting of Mick Jagger, Keith Richards, Ron Wood, and Charlie Watts, SHINE A LIGHT also features surprising appearances from Jack White, Christina Aguilera, and even former President Bill and (future President?) Hillary Clinton. This being a Scorsese documentary, the director also puts in a sustained appearance as well—mostly during the beginning of the film when he takes us behind the scenes of mounting a concert as large as this one. For the most part, SHINE A LIGHT is your run-of-the-mill concert film, covered by multiple cameras while the talent performs onstage. But this being a Scorsese picture, the people behind those cameras read like a veritable who’s who of world-class cinematographers: Robert Richardson, Robert Elswit, Andrew Lesnie, John Toll, Ellen Kuras, and Emmanuel Lubezki. The fact that they’d all collaborate together in capturing a live event under Scorsese’s direction speaks to the immense stature that the director enjoys in the film world. SHINE A LIGHT was shot using a variety of formats, including 35mm film and HD video, making this the first time that Scorsese had worked with digital footage. The choice to shoot HD may not have been the best choice in shooting the Stones, as the increased detail makes them positively ancient. 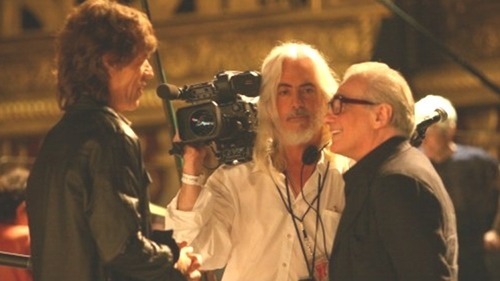 Scorsese’s regular documentary editor David Tedeschi helps cull the best angles from what was no doubt a massive amount of coverage, and that’s before one counts the behind-the-scenes documentary footage shot prior to the concert or the archival interview footage featuring the Stones in their prime. In what could be read as one of his signature directorial flourishes, Scorsese ends the film with an extended Steadicam tracking shot that maneuvers the backstage corridors en route to the chaotic New York City streets. Reminiscent of similar shots in 1980’s RAGING BULL and 1990’s GOODFELLAS, this shot is notable for the opportunity it provides for Scorsese to appear as a subject himself within one of his own signature conceits. SHINE A LIGHT premiered as the opening film for the 2008 Berlin Film Festival, and went on to a healthy run at the box office (arguably due to its presentation in the IMAX format). While it doesn’t tell us anything new about the Rolling Stones and their music, Scorsese’s reverent approach captures the sheer energy of their live performance. In the process, he preserves the band’s cultural legacy while preserving his own as our country’s greatest rock documentarian. SHINE A LIGHT is currently available on high definition Blu Ray via Paramount.